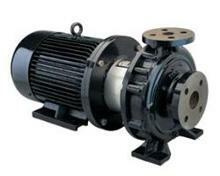 The CM (centrifugal motor) series is a close coupled electric motor pump unit in a ready-to-bolt-down combination. The CM has been designed in consultation with you the customer to be a robust, compact, efficient and low maintenance pump. Corrosive resistant stainless steel and brass construction ensures long service life while the ISOspec impeller has been hydraulically engineered to maximise flow and efficiency that ensures long term cost efficient pumping.